randomly there is <a name="feed></a> on every page. is that an error or does that do anything? name = feed would not. [eddie]: There are too many cases of feeds that aren't marked up as feeds. My post processor wasn't handling that. I just fixed it. Also had to add author tags where I didn't have them, but unrelated other than one exposed the other. 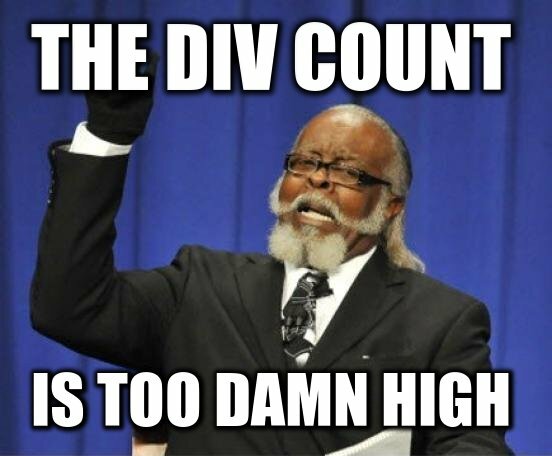 I thought each extra div killed a fairy. petermolnar looking at the contributor list I know a few of them...wonder if it lives on somewhere. karthikprabhu helped me get my divs down quite small in the resume..
[kevinmarks]: have you documented somewhere how you got the mf2 for epeus.blogspot.com ? Yeah Google+ shut down 4/2. We get that guide out there be a lot of Blogger folks who would want to do it. the theme language is complicated, yes. !tell [grantcodes] we should consider using the now open source Mercury Parser (written in Node) in Together for loading full content for articles that don't embed all of their content in their feeds. they have hentry and hfeed, maybe add hyphenated ones? And I can publish tireless posts. anyone has "collection" style posts? like intermixed with photo, video and what not? > The prevailing idea on marking up collection posts is that a collection is an h-entry that contains children h-entries. There's also the "what comes first in Micropub spec dictates post type" approach. I think it would be logical if it followed the same path? please document what you do for collections and what you see doing it on /collection, for things that are in flux that's especially important! [cleverdevil] I could look at switching out the full article parser in together, not checked yet but what makes Mercury parser better? Children could be replies or citations too, right? This is a note test hey folks. Sounds to me like this would pretty severely hurt Webmentions and the @indiewebcamp community, Mastodon community etc. » Loqi does a happy dance! [Tantek Çelik] h-entry is a simple, open format for episodic or datestamped content on the web. h-entry is often used with content intended to be syndicated, e.g. blog posts. h-entry is one of several open microformat standards suitable for embedding data in HTML. can you add it here: gist.github.com/jgmac1106/1bea040bd2d2f65151b43bff14c6c205? <!here> developers, do you work a Micropub client? Can you make sure your client has an exemplary screenshot in its entry here? indieweb.org/Micropub/Clients Thanks! !tell Skenbel thx will try theme edit and let you know.